Narre Warren Mechanics' Institute. Opened on this site 1891. The Mechanics' Institute movement began in British urban industrial centres in the early 1800s. A "mechanic" was a person applying skills and technology. During the 19th century, most towns in Victoria established a Mechanics' Institute or Athenaeum with a library and meeting hall. Common objects were the "spread of useful knowledge" and provision for "rational recreation" in the community. The land was donated by Mr. Sidney Webb in 1890. The total cost of the hall £384 was funded by donations and collections. Two side extensions were added in 1899. Celebrations were held in November 1891 to mark the opening, and again in 1899 for the extensions. 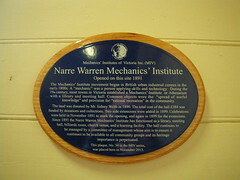 Since 1891 the Narre Warren Mechanics' Institute has functioned as a library, meeting hall, billiards room, church venue, and a learning facility. The hall continues to be managed by a committee of management whose aim is to ensure it continues to be available to all community groups and its heritage importance is perpetuated. This plaque, No. 34 in the MIV series, was placed here in November 2013.